Welcome to the QuickBooks Showcase! The showcase below is a tool built by Intuit. You can use it to get a free QuickBooks Enterprise trial or to browse QuickBooks products by industry or the size of your business. 6X more capacity over other QuickBooks products - Add up to one million names. Track hundreds of thousands of customers, vendors, and items. Flexibility that grows with your business - Easily set up 1 to 30 users.3 Manage your accounting, your payroll, payments, inventory, and more. The QuickBooks look-and-feel you love - New to business management software? Don’t worry, QuickBooks Enterprise has the friendly, inviting QuickBooks look-and-feel that makes managing your business needs a snap. 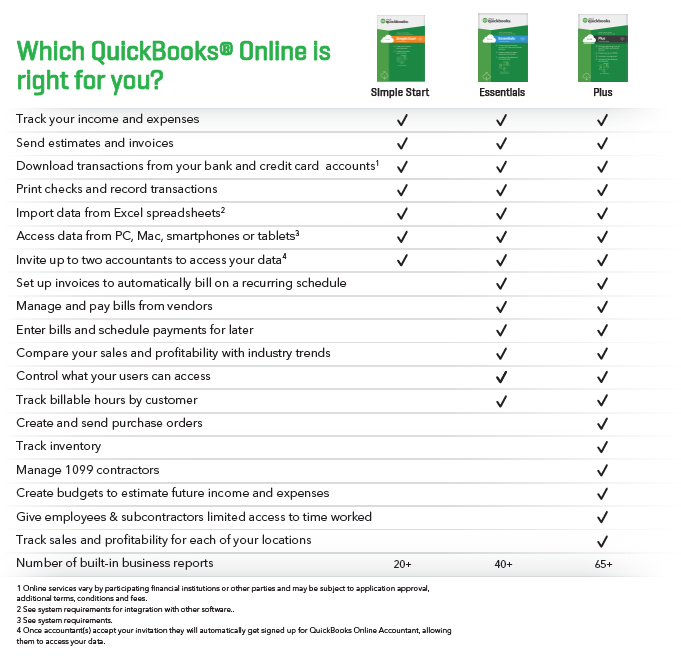 Business runs better with QuickBooks, the #1 accounting solution for small buisness. All transactions sync up with Quickbooks and Intuit Point of Sale products to help you fully manage your business. Auto calculate sales tax, personalize receipts and add your businss log to fit your business needs. It's so easy to get paid. Swipe, key, or take a photo of your customer's credit card information. Or process the transaction online. Credit card charges are processed instantly email or text a recipt to your customer. !--' , !--'PBannerAssetType!--' : !--'!--' , !--'OverviewSummary!--' : !--'Accept payments anywhere with mobile credit card processing. No more duplicate transaction and financial entries. Make it easy for your customers to pay you quickly. When you turn on QuickBooks Payments, you'll have the ability to put a ""Pay Now"" link on every invoice you send. Customers can click and pay instantly with any major credit card or a bank transfer. And, since QuickBooks Enterprise Solutions updates itself automatically and sends payments directly to the bank, you'll always have the most current information on your bottom line. Fewer mistakes, less work, and less worry. The QuickBooks Enterprise Solutions Full Service Plan now includes preferred rates for QuickBooks Payments-on top of the exclusive access to US-based support, upgrades, training tools, and much more. We think you'll be delighted with the end-to-end integration that QuickBooks Payments and QuickBooks Enterprise Solutions provides. With a $0 monthly fee and no long term contract, why not give it a try? Sign up for QuickBooks Payments. Accept bank payments (ACH) and all major credit cards including Visa, MasterCard, Discover, and American Express. All your payment processing needs are built into QuickBooks . Accept credit cards, debit cards, and bank transfers (ACH Online), and get paid with your iPad® or Android™ device. QuickBooks updates your books automatically as soon as your invoice is paid. We auto-deposited, too. Two simple pricing plans. Choose what's best for you. Rates subject to change. *Applies to QuickBooks Online only. !--' , !--'PBannerAssetType!--' : !--'!--' , !--'OverviewSummary!--' : !--'A simple click of the button gets you paid with E-Invoicing. Spend less time fretting about work order status, receivables, and the productivity of your technicians. With Intuit Field Service Management ES, you can simplify your business while gaining more control over your people, customers, cash flow, and costs. Plus, it works seamlessly with QuickBooks Enterprise to make sure your financial and field service data is up-to-date. It couldn’t be easier to schedule or reschedule work orders. With Field Service Management ES, dispatchers get a dashboard filled with useful information, such as work orders, location, and status for each technician. Technician running late? Simply drag and drop the work order to a new technician to reassign and reschedule. Field Service Management ES lets you know what each technician is working on, and job status and duration. You can see the arrival time of the technician and the hours clocked. In a single click, you can also view and edit the details of the job. Make sure the job gets done right the first time by storing all the customer’s contacts and equipment information. Your technicians will know the service history of the equipment before a job starts. It’s valuable information that can boost first time-fix rates - and make happier customers. Eliminate the hassle of paper and go mobile with our app for Apple and Android phones and tablets. Gain better control over your processes and information with immediate work order info, technician schedules, and quick rescheduling. Make smarter decisions in the field with access to customer history in real-time. Google Maps integration lets you track your workers and locate customer sites with ease. Minimize travel time and get more done each day by easily shuffling work orders. Merchant Services Process payments in the field using the Field Service Management ES mobile app with the QuickBooks Merchant Services integration2 to save time and improve cash flow. Payments are automatically associated with your invoices in QuickBooks when you process payments with QuickBooks Merchant Services. QuickBooks Enterprise’s exclusive Advanced Inventory integration lets you track your truck and warehouse inventory. Inventory placed on an invoice is reduced in the invoice synchronization process when you set it up to manage truck inventory - no need to reconcile it later. Improve your productivity by giving your team whenever and whenever access to your QuickBooks Enterprise.1,2,3,4 Hosting Service also offers you the benefits of additional data protection,5,6 quicker startup, and maintenance behind-the-scenes. We’re pleased to provide cloud hosting via Right Networks®, a top enterprise-level hosting provider. Data is backed up nightly and kept on file for 90 days. Files and transmissions are protected by enterprise-class anti-virus technology, firewalls, encryption, and multi-layer access controls.5 Also included - customer support based right in the U.S.! 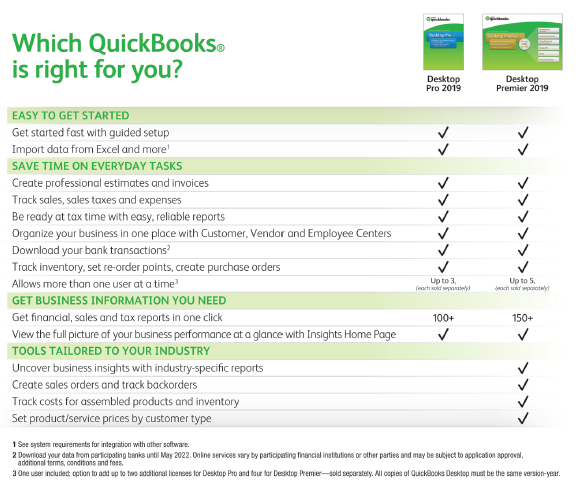 The special features of QuickBooks Enterprise for Retail help you track your sales, inventory, and customer info. You can also transfer this data to your books in one quick step by pairing it with QuickBooks Point of Sale software (sold separately). Save time and money by controlling costs and cash flow with QuickBooks Enterprise. With QuickBooks Enterprise accounting software for manufacturing and wholesale, goods are constantly tracked as they come, go, and change. Accounting software and tools keep everything in line, while our Advanced Inventory2 functionality handles more complex inventory needs. It’s never been easier to use our most powerful QuickBooks reporting tool, Advanced Reporting.1 Templates bundled for manufacturing, wholesale, contractor, and retail industries make searching easier, template reports auto-filled with your company data save you time, and a comprehensive help portal offers you reporting answers whenever you need them. You won’t have to sort through hundreds of reports to find the one that works best for you. We’ve bundled reports for manufacturing, wholesale, contractor, and retail industries, such as Sales by City, Job Type, and Customer Dashboard, Sales Profitability by Customer Dashboard, Backorder Report, Paid Invoices by Sales Rep… and many more. Nobody enjoys performing manual entries over and over again. Our new auto-filled template reports populated with your company data spare you that chore. They also help lower your risk of errors caused by manual input. Looking for support? Just want to learn something new about reporting? Check out our comprehensive help portal. It has numerous how-to videos, tutorials, studies, and help documents that can help you find the right reporting solution, right now. With QuickBooks Enterprise’s exclusive Advanced Pricing,1 you can control, customize, and automate your pricing - all within QuickBooks. You don’t have to worry about manual updates. Now you can change your prices with ease to help boost your bottom line. Advanced Pricing lets you set thousands of price rules using any combination of factors - customers, items, vendors, classes, custom fields, and more. It’s the most robust inventory management functionality QuickBooks Enterprise has to offer. With Advanced Inventory, you can track warehouse items to specific bins, enter data quickly by scanning barcodes, set up FIFO inventory costing with ease, manage items by lot numbers or serial, transfer items between inventory sites, and obtain inventory value across multiple locations. Accounting Therapy incorporates Intuit products with our stellar services, providing you with a one-stop shop for your business' financial system needs. We are QuickBooks Pro's with high-level certifications and expertise on Intuit's products and services. Our relationship with Intuit allows up to bring you the best products and solutions to give you the tools for your business needs. Showcase Content © Intuit Showcase 2019. All rights reserved. Showcase and Syndication technology powered by Zift Solutions® 2019. All rights reserved.